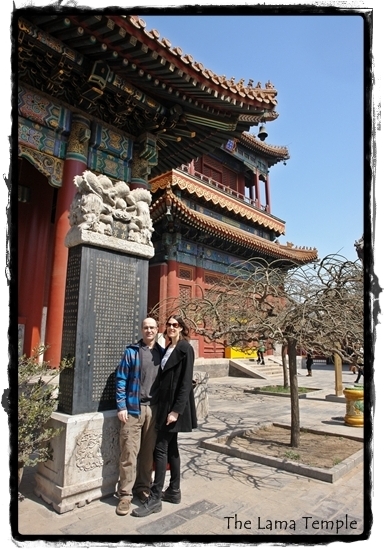 On April 4th, 2012, during the Qiming festival, we had a great time exploring the Lama Temple. The Qingming Festival (also known as Pure Brightness Festival or Tomb-sweeping Day), which falls on either April 4th or 5th of the gregorian calendar, it is also a day of paying respect to the dead, a spring outing, and other activities. 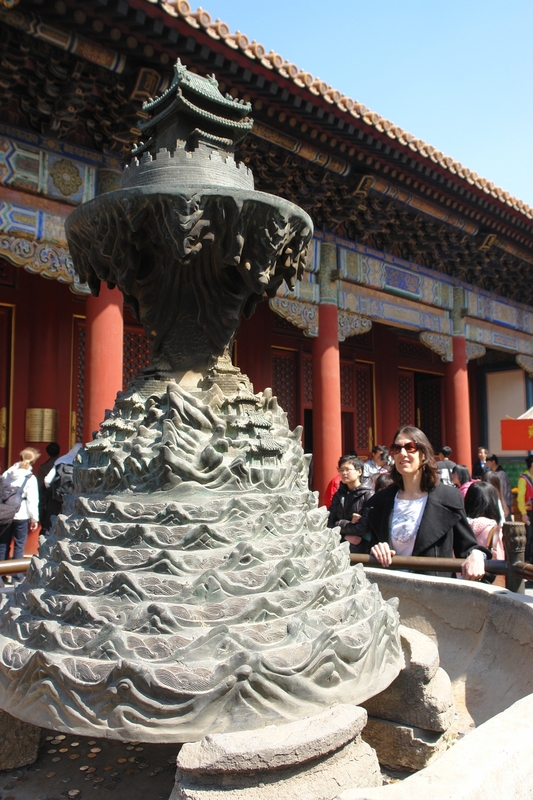 The Yonghe Temple, also known as the “Palace of Peace and Harmony Lama Temple”. It is one of the largest and most important Tibetan Buddhist monasteries in the world. 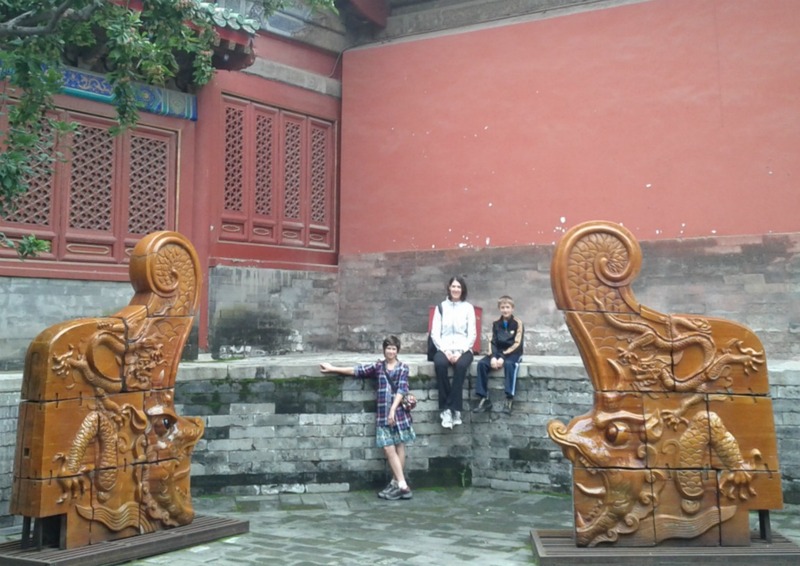 The building and the artworks of the temple are a combination of Han Chinese and Tibetan styles. 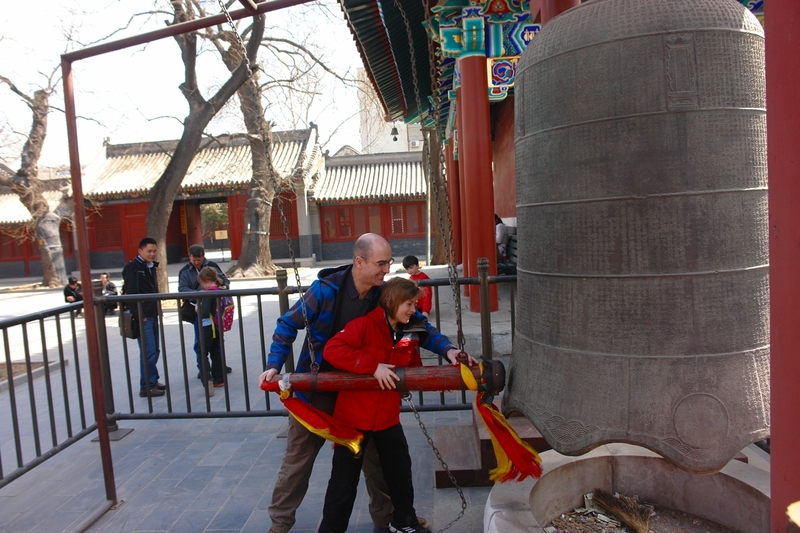 Shane and Max ringing the huge sacred bell. Making a wish with coins. Happiness….Max making the coin onto the lucky ledge. Click here for video 1. Click here for video 2. 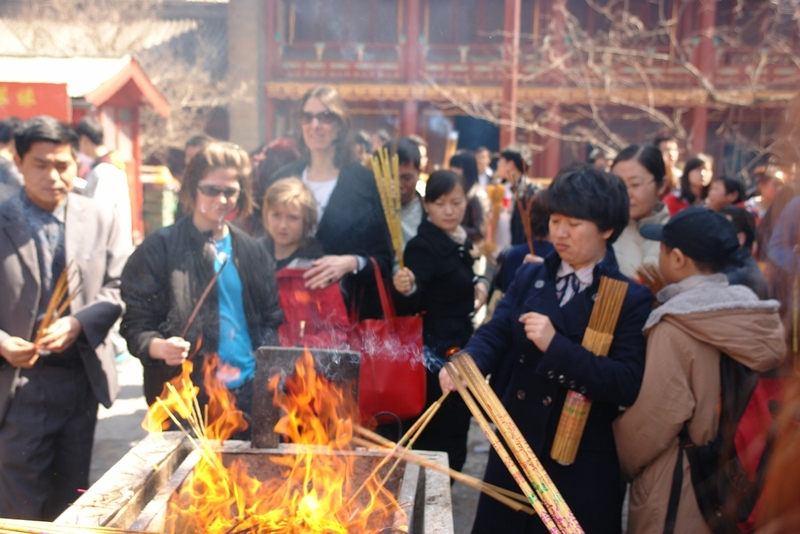 Hundreds of visitors burning incense. 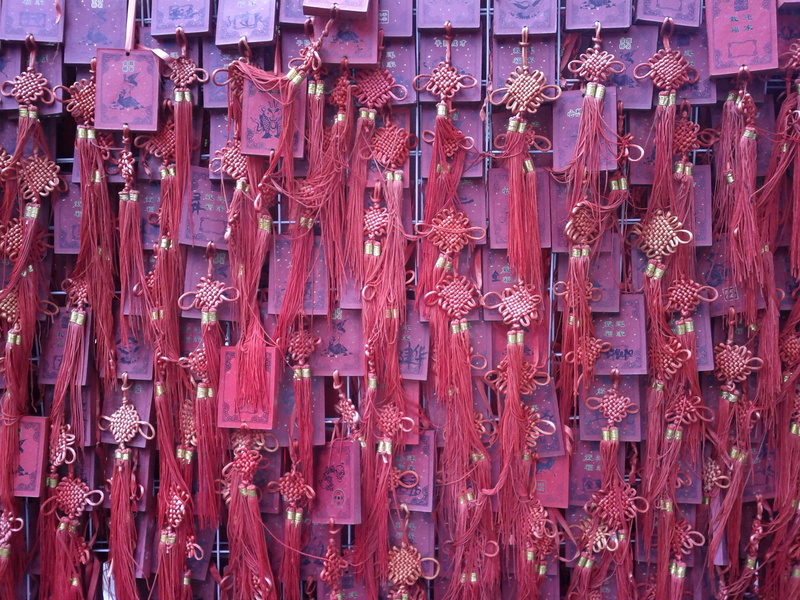 Everlasting Protection (Yongyoudian), the Hall of the Wheel of the Law (Falundian), and the Pavilion of Ten Thousand Happinesses(Wanfuge). 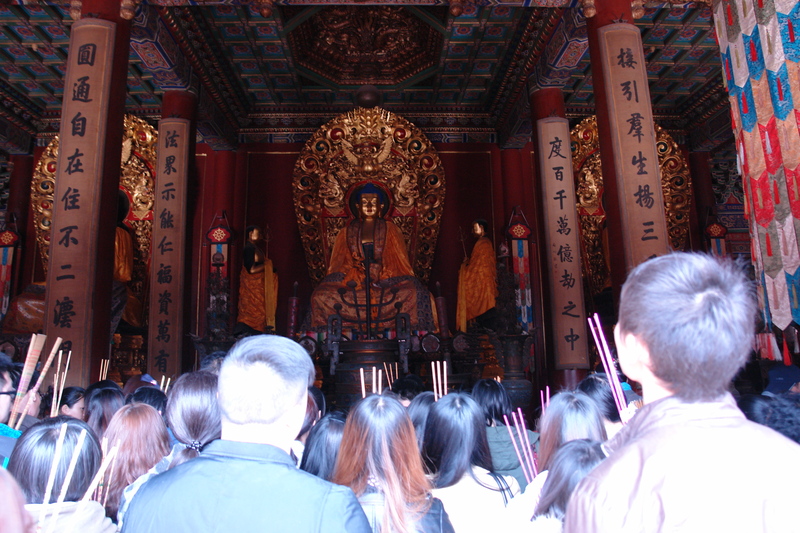 The Hall of the Heavenly Kings is the southernmost of the main halls, it served originally as the main entrance to the monastery. 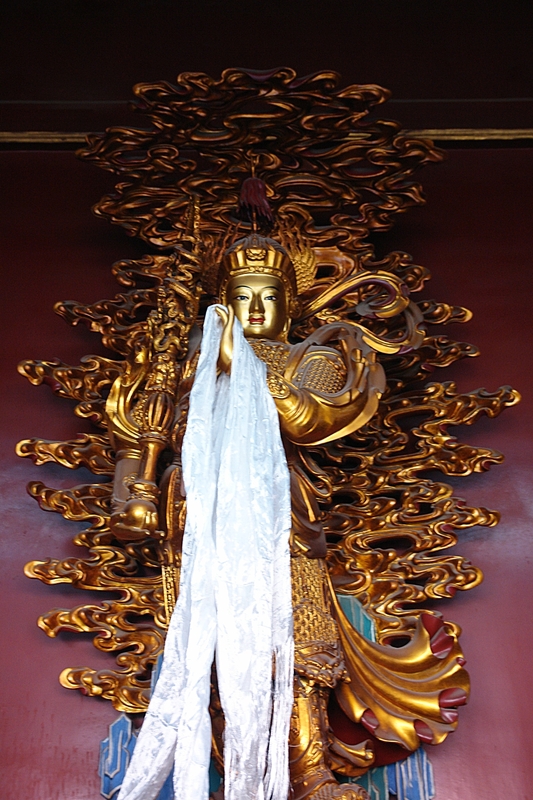 In the center of the hall stands a statue of the Maitreya Buddha, along the walls statues of the four Heavenly Kings are arranged. The Hall of Harmony and Peace is the main building of the temple. 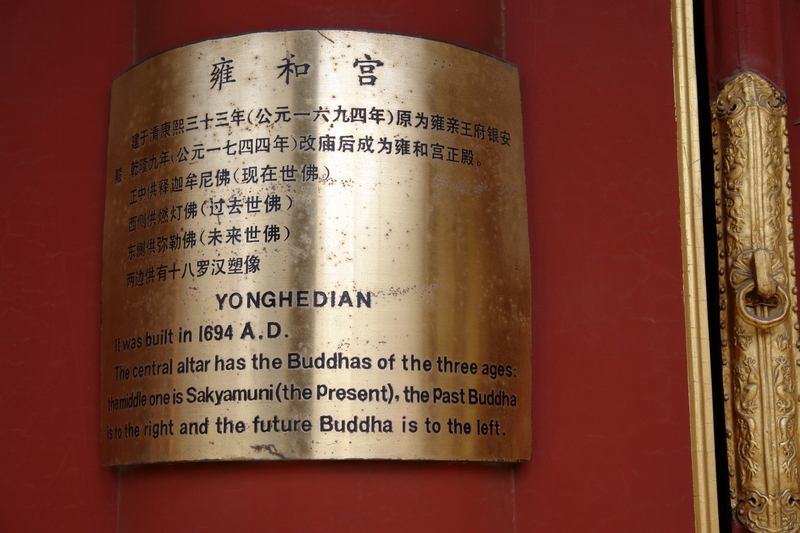 It houses three bronze statues of the Buddhas of the Three Ages, (Buddha of the Present) is in the center,(Buddha of the Past, right) and the (Buddha of the Future, left). 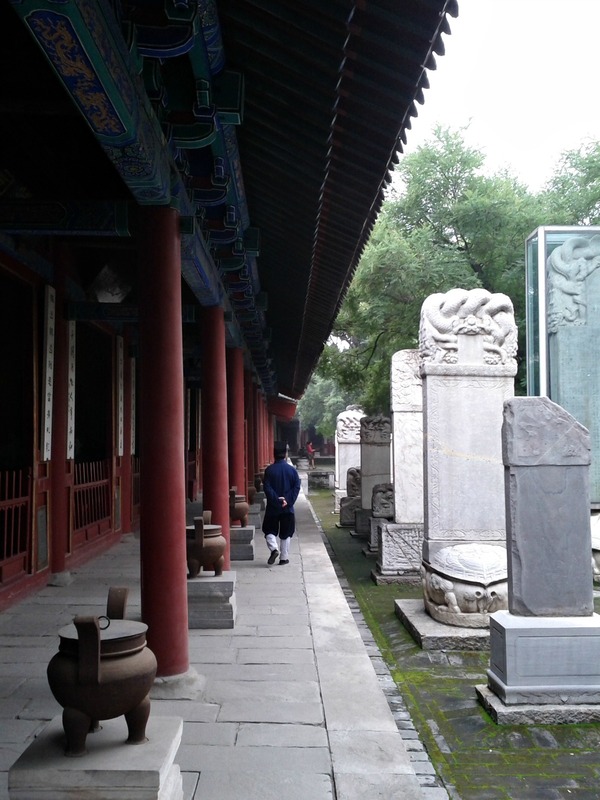 The Hall of Everlasting Protection was Emperor Yongzheng’s living quarters as a prince and the place where his coffin was placed after his death. Today, a statue of the Bhaisajya-guru (healing Buddha) stands in this hall. The Hall of the Wheel of the Law functions as a place for reading scriptures and conducting religious ceremonies. 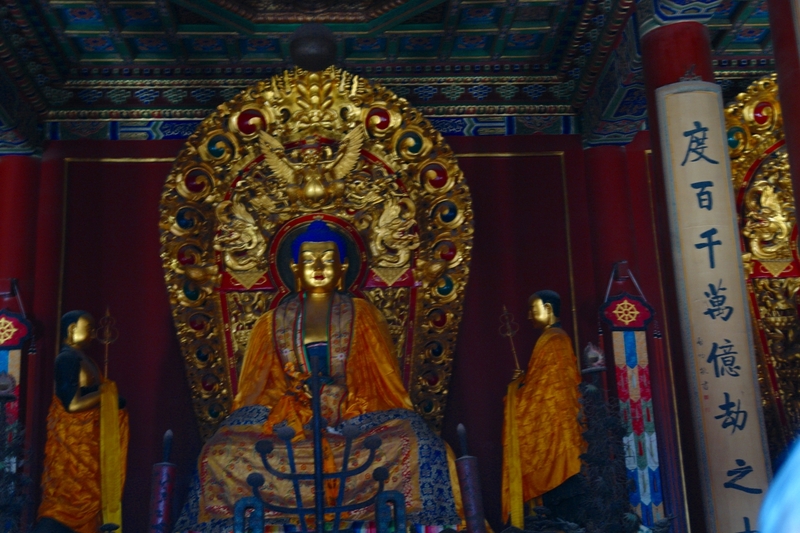 The hall also contains the Five-Hundred-Arhat-Hill, a carving made of red sandalwood with statues of the arhats made from five different metals (gold, silver, copper, iron, and tin). 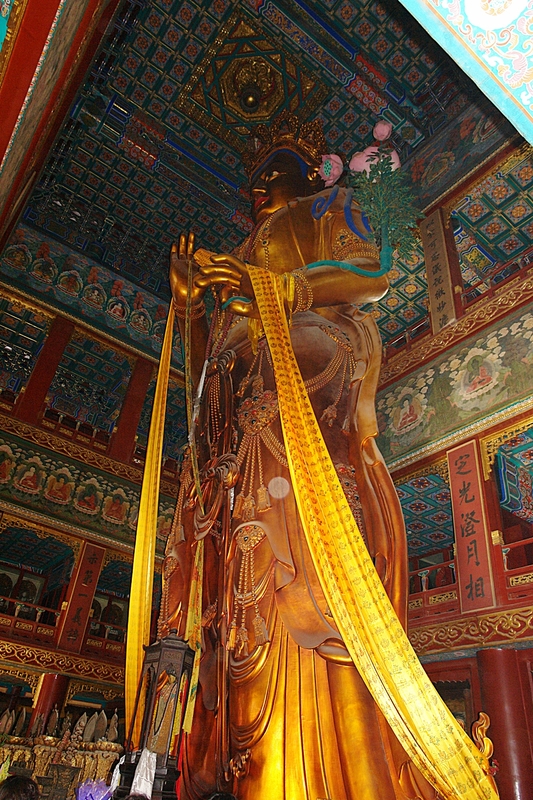 The Pavilion of Ten Thousand Happinesses contains an 26m tall (18m above the ground and 8m underneath) statue of the Maitreya Buddha carved from a single piece of White Sandalwood. The statue is one of three artworks in the Temple which were included in the Guinness Book of Records in 1993. Amazing Buddha made of sandelwood. 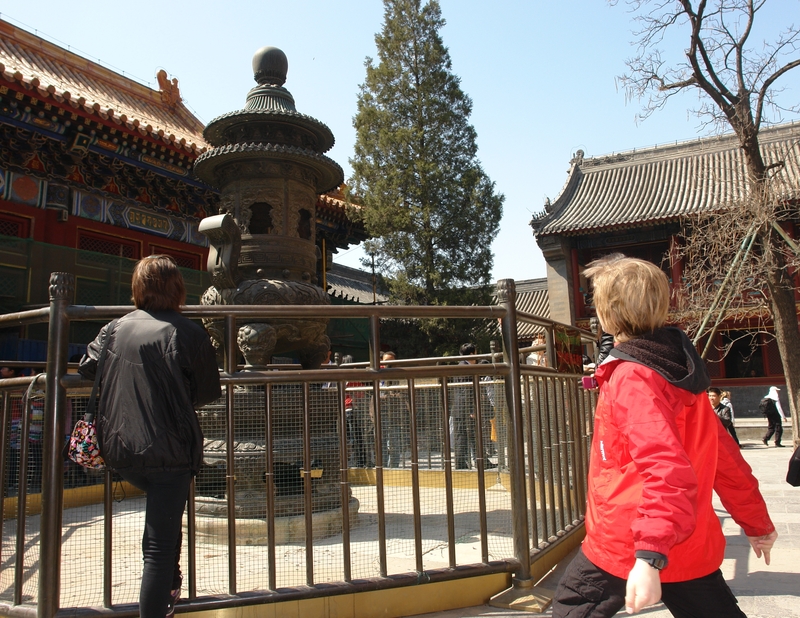 The temple is said to have survived the Cultural Revolution due to the intervention of Prime Minister Zhou Enlai. It was reopened to the public in 1981. 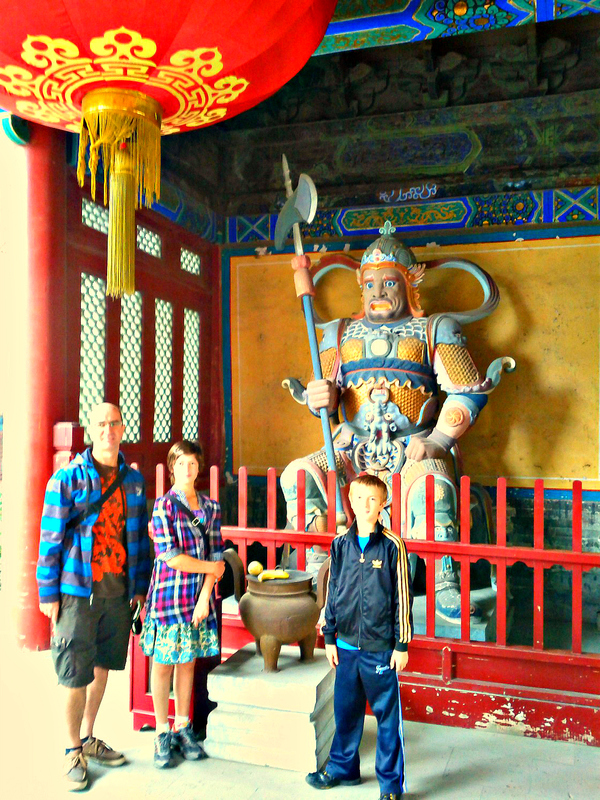 On September 12th, China’s National Holiday, “Mid-Autumn Festival”, we went to Dongyue Temple. The kids were not too enthused about going to our neighborhood temple only 3 blocks from our apartment. They had more adventurous ideas on their minds. 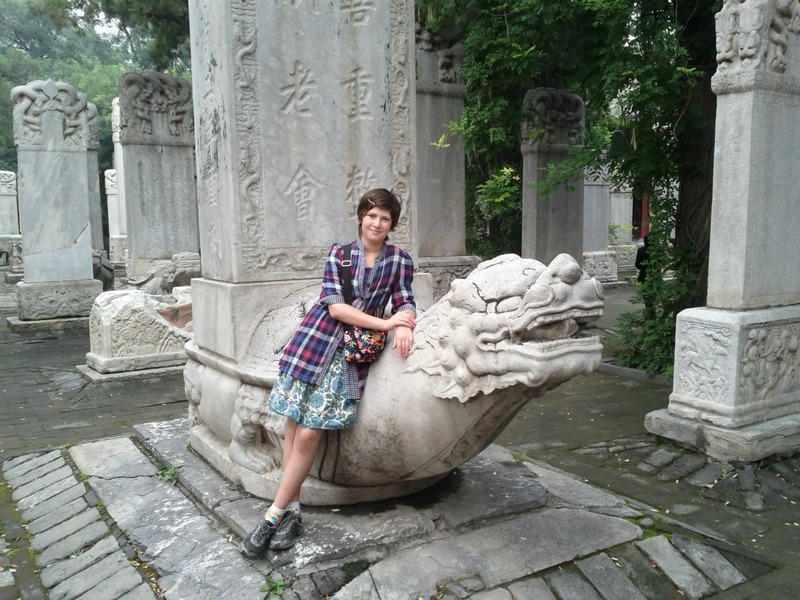 But little did we know that it is Beijing’s most morbid temple! The kids ended up being mesmerized by all the scary creatures…. Ancient Samurai Warrior greets us. 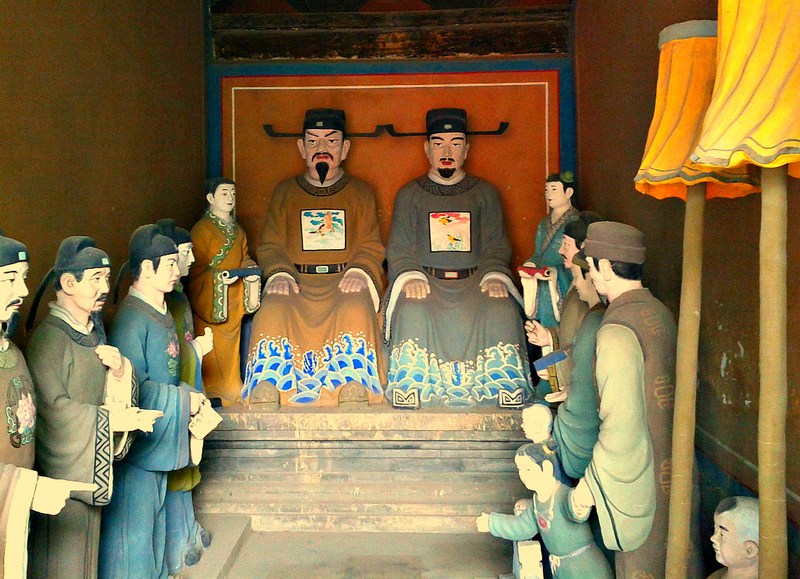 Life size plaster figures representing the Chiefs of Departments. 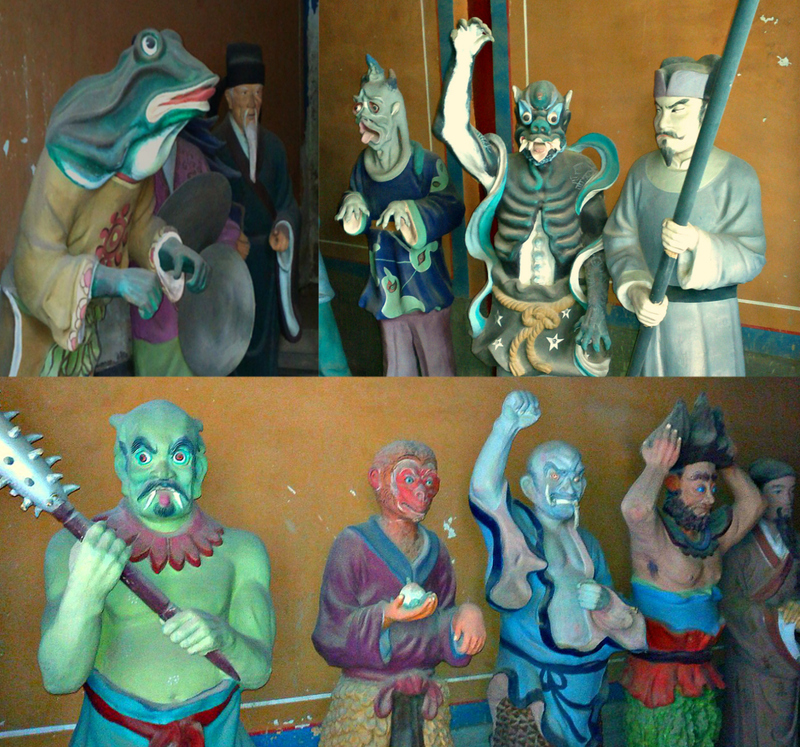 The temple is populated by hundreds of amazing life-sized plaster figures.The figures make up the “73 Chiefs of Departments and 18 Layers of Hell” offer protection from harassment in the netherworld in return for devotion and a suitable offering. Just a few of the hundreds of scary creatures we saw. 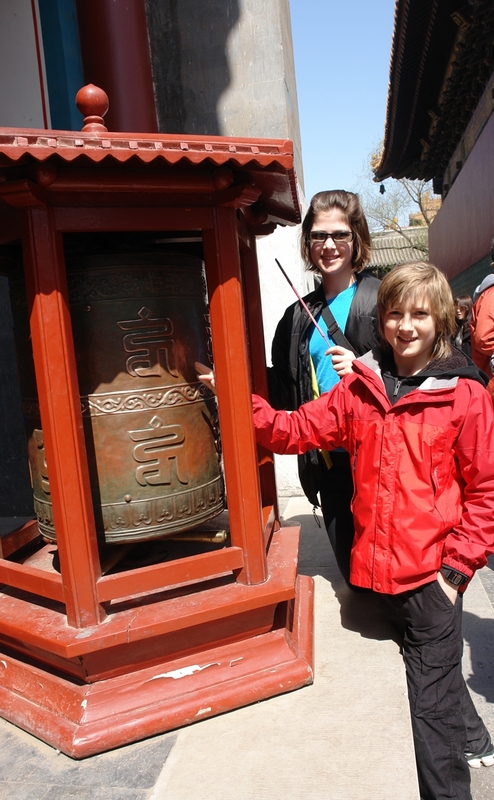 It is still a working Taoist temple, Dongyue is dedicated to the God of Taishan (one of China’s five holy mountains). 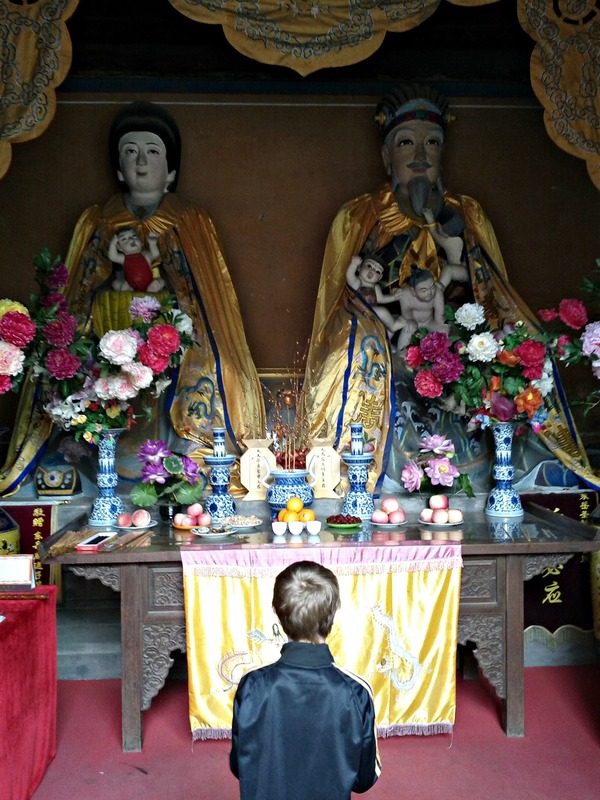 Max at Mother and Father temple of good fortune for children. Temple official walking the corridors. Sepia at spiritual tombstone area. 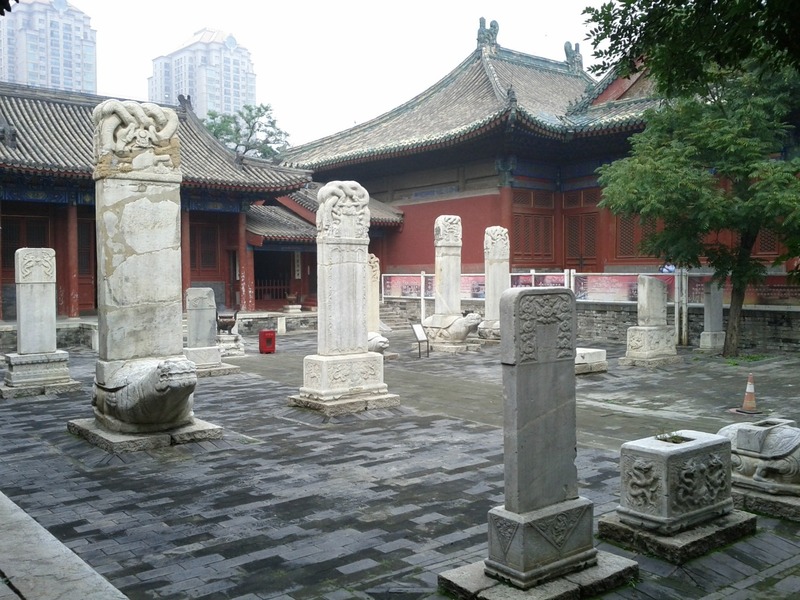 Temple Courtyard showing high rise buildings in the background. An overwhelming number of prayer tags left at the Department of Morality for Officials.